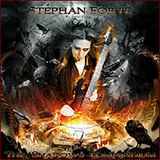 The mood was as such this week that the instrumental album by a Frenchman Stephan Forte I was asked to look into was a perfect respite. The last thing I needed was for someone to scream in my ear. Not being familiar with Stephan’s output in his main power progressive outfit Adagio should not disqualify me from judging The Shadows Compendium, and even more so makes me an unbiased listener. Judging an instrumental album from a virtuoso guitar player, I’d be hard pressed to do it based on his/her finger maneuvers on the fretboard. It is fairly obvious that all of those guys and gals can play. When presented with an album like The Shadows Compendium I look at it based on the following parameters: is this just a skill exposition for a total showoff, are the compositions basically songs for whom someone forgot to write lyrics, can I go with the flow and enjoy this music. Several listens to the album and I was ready to give optimistically inclined answers to all of these questions. The Shadows Compendium is certainly not an album of simple sing-along melodies with the words missing. These are complex, involved, weaving compositions, but it is a lot more a full-bodied progressive music, rather than mindless shred. The cuts on the album actually do not take long to get into, and they tend to tell stories, if you are willing to give it a chance. Maybe surprisingly, but many compositions on The Shadows Compendium project hints of darkness. De Praestigiis Daemonum is certainly not flowery with its piano notes and bent guitars. Duat is part dark tango, part Renaissance clavesin, Sorrowful Centruroides has a Spanish beginning, but then it is mostly brood with a few hints of joy (the story of my life, or so it seems). Even Spiritual Bliss, which starts with a bright shiny morning feeling, when you get out of a bed stretching after a good night sleep, tends to grow more introverted in an apparent mood shift. With a pair of his friends musicians from Adagio, Stephan does not lack in complexity in the rhythm department. I Think There’s Someone In The Kitchen first pits syncopated rhythms vs. fluid guitars, and then reverses the trend making the rhythms steadier while the guitars jump around. Prophecies Of Loki XXI, fitting to its title mentioning the Scandinavian god of mischief, is the most aggressive composition, from its guitar chops to piano chords. And every classical music lover will love the bluesed up version of Beethoven’s Moonlight Sonata, less known as Sonata No. 14, C # minor – Op. 27, No 2 on which Stephan provides Improvisations in the album’s closing track. I can’t possibly say that The Shadows Compendium had me in the vise grip from start to finish. There were moments when mundane meanderings seemingly lasted too long (De Praestigiis Daemonum), or the cool topic could have stretched a little longer but was cut short for some reason (the opening title track). There were “holes” when my attention waned, but it was quickly brought back into focus. On the balance, The Shadows Compendium is a quality work with interesting ideas, memorable moments, and, most importantly, circling back to the opening of my review, it caught me in the right frame of mind. If the album does the same to other open-minded listeners, it will have a chance to gain fans.